Please refer to our stock # J131 when inquiring. There are 3 pairs of serving trays in this boxed set of Japanese sushi trays. Each pair is a different size and color combination. Each tray displays the family mon or emblem on the front. There are 2 red trays, 2 red and black trays, and 2 all black trays. 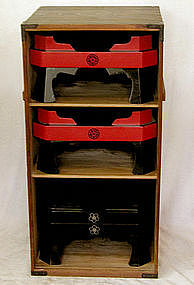 Being Japanese, the pairs of trays nest together a specific order to be stored in the carrying box. The kiri wood box has a strip of wood on each side to act as a carrying handle. The box is 14.25 inches (36 cm) square by 28.25 (72 cm)high.